Andrew Barnham has done an independent assessment of the BOM trends, using a slightly different methodology to Ken Stewart, but like Ken, this raises grave doubts that our high quality records are done in a rigorous manner. We need both the BOM and CSIRO audited, independently. As usual, Barnham did this pro bono and deserves a big thank you for his dedication and skill. The article Australian warming trend adjusted up by 40% was published on Jo Nova’s blog on 29th July 2010. This work by Ken really caught my attention as it stands in stark contrast with consensus claims that the homogenization process is simply a ‘fine tuning’ process and that it barely impacts the final trend result. For example, on GISS website, generating anomaly trend graphs using adjusted or unadjusted data yields very little difference. So assuming that Ken’s result is accurate, then the Australian dataset stands at odds to this. The following is largely a replication of Ken’s work, using slightly different tooling and methodologies. 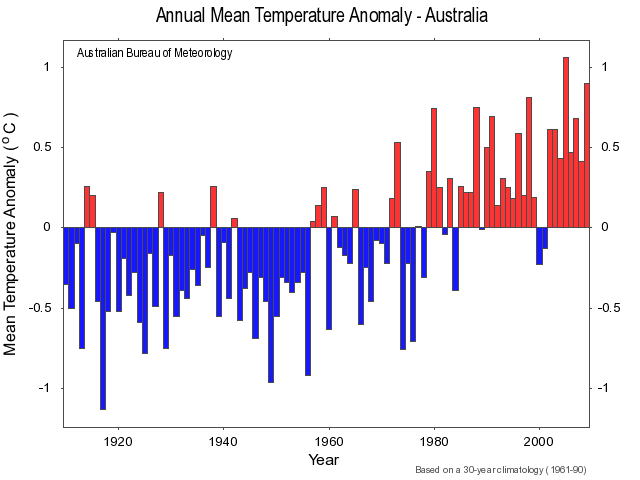 In this I analyze Bureau of Meteorology (BOM) data comparing modern temperature sets used by the BOM to construct Australian land surface anomaly figures used by the BOM for purpose of contributing to the climate change narrative. I scrutinize raw data compared to adjusted data. I also scrutinize the process BOM use to compensate for local climate effects. A link to all computer source codes used in this analysis can be found at the bottom of this article. Firstly, credit to the BOM for making the information very easy to access and for structuring the data in a consistent and easy to analyse fashion. Because of this, it only took me a few hours to secure and organize the data which allowed me to focus on actual analysis. Some months ago the Bureau of Meteorology published this now famous image which is readily accessible on their website. It is a temperature anomaly reconstruction of Australian land surface temperatures that shows that based on a 1960-1990 baseline period, Australia has warmed by 0.9°C over the past century. Following is my reconstruction of the same data set using their High Quality (HQ) adjusted data series. Visually the results are a very close fit which gives me confidence that I have replicated their process with sufficient accuracy (the process they use is not documented). “… if only stations currently operating and with at least 80 years of data are considered. To increase the number of long-term stations available, previously unused data were digitized and a number of stations were combined to create composite records”. Ideally we want to use stations that provide long term continuous data. Now consider the following three graphs that graph both adjusted and unadjusted temperature series. These sites contain hardly any raw data (blue line) at all. In spite of this BOM include these stations and reconstruct 100 years of temperature data using some undisclosed process. It is not documented the precise steps BOM used to reconstruct these phantom records although the Torok study indicates that this is done by splicing data from nearby stations and then correcting for discontinuity using the homogenization process. Torok states that this is necessary due to an absence of long term station records. What is unusual although is that there is a lot of station data which appears to satisfy the requirements for HQ data, but these stations are ignored by the Torok study and are not included in BOM HQ climate change series. 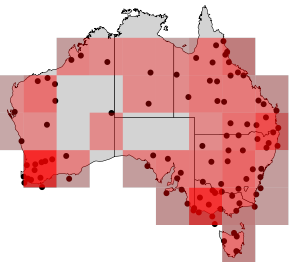 If we define good stations to mean stations with at least 80 years of data and are still active (or assumed to be active if there is data for 2009) then in Australia we have 62 stations that qualify (out of a total of 1,144 stations that have at least 10 years of data). Of these 62 stations, 38 are included in the HQ climate group, and 24 are ignored. The reason why so many stations are ignored is not clear, maybe there are undisclosed problems with the data sets. The absence of these stations does not have an undue effect on gridded trend results. Never-the-less it seems unusual and something of a waste that BOM would disregard stations with long-term data sets; and opt in part to reconstruct temperature series data from smaller sized records. Returning to the issue of raw data analysis. A cursory look at some of the stations, this comes as no surprise. The Urban Heat Island (UHI) effect is a real effect that requires careful handling when dealing with surface temperature records for purposes of global climate change analysis. So a simple, yet somewhat crude, way to remove UHI from the climate change equation is to look at maximum daytime temperatures only as opposed to min/max average. This technique is crude because it likely that the difference between annual maximum trend and minimum trend is attributable to factors other than just UHI. It gives us at least an approximate possible upper margin for UHI. It is likely that there are indeed forces at work whereby emissions based global warming applies itself with different intensities between day and night: just as UHI manifests itself differently between night and day. Following is a graph of the raw data set with daytime temperatures only, presented with intention to better understand the UHI signal, on the understanding that doing so may also remove some component of the nigh-time global warming signal (if any) at the same time. So the technique is not particularly rigorous, but is presented for purposes of expediency. The issue of UHI is complex and merits its own, more detailed, treatment. BOM have chosen to deal with UHI by removing entire stations classified as urban: which I have also done so far. The HQ temperature series actually includes 134 stations: 100 are rural and 34 are urban. But this process is arguably even less rigorous than looking at daytime temperature only. It assumes UHI is a binary effect and this is clearly not the case. UHI is observable for even very modest rural population densities. Extraordinarily, Urban stations only reduces the observed trend. 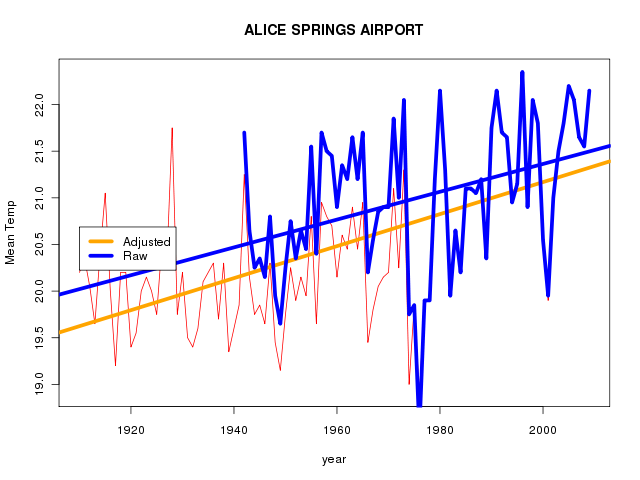 The raw temperature trend goes up and down in such a way that seems to indicate that the data may be harbouring a statistical paradox known as Simpson’s Paradox. Why this comes about merits close examination, which is beyond scope of this article. But a couple of speculative points. Gridding is statistically fraught when you consider that stations cluster close to population centres. Some grids within the Rural HQ/Raw analysis only have a single station in them. So the influence of a single temperature station located in the Australian outback is more statistically significant than the readings from 20 or so stations located in a grid on the Australian South/East coast. This doesn’t mean gridding is bad, it just means that ideally it would be nice if distribution of stations was more uniform; and the absence of the ideal means that risk of statistical artefacts is higher. Another, equally wild, speculative point is that UHI in major population centres has already run its course. UHI observations show that the effect of UHI is logarithmic. So a city growing from 3 million to 4 million people will exhibit less UHI than a town growing from 100 to 1000. So stations designated as ‘rural’ will actually be subject to a stronger UHI anomaly signal because of this. Of course a counter argument to consider is the point of view that UHI is not a significant effect at all. Yet the trend figures against CSIRO figures for the City of Melbourne (Australia’s second largest city), indicate that UHI is indeed a significant climate force and the fact that BOM’s processes do not replicate this in the trend numbers suggests that they are possibly not adequately dealing with the issue of UHI. It’s a confusing array of numbers that raises more questions than answers. Just one of many possible questions: why is Urban Max so different from Rural Max? According to the CSIRO, UHI does not significantly impact max temperatures so why the distinct discrepancy (in both HQ and Raw)? What else could possibly explain this variation? Finally, a word on the homogenization process and its relevance to the issue of UHI. The homogenization process is concerned with correcting for a number of items that can affect temperature data, such as station moves, changes to immediate station environment (construction of new nearby buildings), station equipment etc. No attempt to correct for UHI forms part of homogenization process; nor can it. Homogenization applies discrete step-wise adjustments which is likely a poor model for UHI where UHI is a continuous function of population and the process of urbanization. Looking at land surface record of a single continent doesn’t necessarily deepen our understanding of the climate system and the extent of human industrial impact on that system in terms of emissions such as CO2. Yet results of studies such as Torok and Della-Marta and BOM climate change artifacts in general are used to justify policymaking that potentially has a significant impact on daily Australian life. My results raise a number of issues with the quality of the data and supporting analysis provided by BOM. Of the 0.94 trend reported by the BOM at least 20% and possibly as much as 40% is certainly man made but not as a consequence of global warming. UHI is man made, and statistical artefacts of the homogenization process are strictly speaking man made too: made by BOM employees to be precise. But neither of these are caused by global emissions. Of the remaining 60%-80% what precise component of which can be directly attributed to global human emissions remains uncertain and is beyond the scope of this article. The homogenization process is a very blunt and un-subtle analysis tool. When it is wielded by some groups it generates outcomes that are barely discernible (such as GISS). Yet when it is yielded by the BOM the impact on the final anomaly figures are quite dramatic. BOM implicitly claim to compensate for UHI by virtue of removing stations designated as urban. But the methodology they use has no appreciable effect on resulting trends and as such it seems likely that it is an inappropriate methodology. BOM disregard a number of stations with long term data. Instead they utilise a process of merging data from multiple nearby stations and attempt to correct for discontinuities in the resulting dataset via the homogenization process in order to boost the number of stations in their data set. A highly fraught and subjective process that exposes them to further criticism. 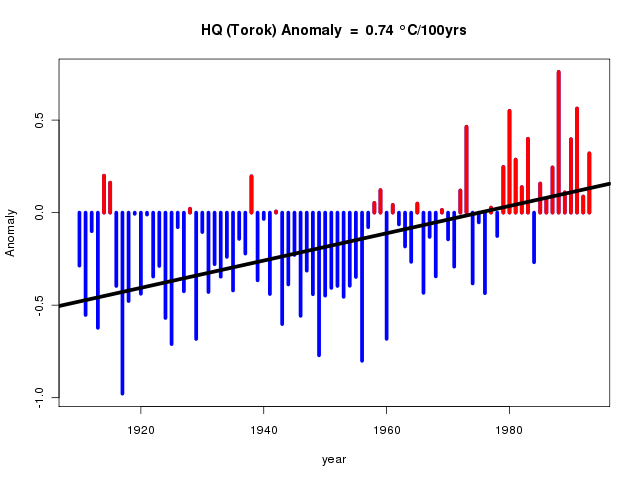 Finally it is important to note that although the HQ series is adjusted upwards as much as 20% as a consequence of BOM homogenization, the raw temperature series still demonstrates an upward trend of 0.72°C per century. This figure, without attempts to compensate for UHI, is consistent with what is reported in global land surface temperature series sets such as GISS. Precisely what component of this trend represents a signal that indicates Co2 emissions driven AGW is outside the scope of this analysis. Download a 12 page PDF for printing or emailing. A link to the computer source codes will be available soon here for anyone who is interested in replicating this work. It’s probably time the BOM stopped refering to their data as “High Quality”. * Homogenised to conform to IPCC standards. Data sources incomplete or unavailable. Influence of urban heat island UUHI) unknown or not adequately accounted for. 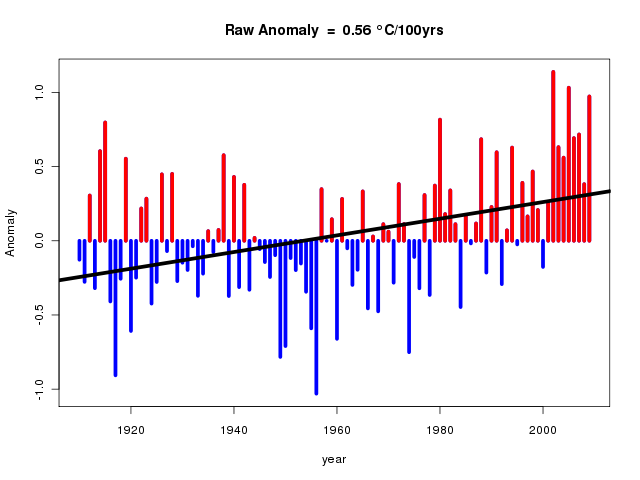 Data in recent records will be warmer than they actually appear. It’s worse than we thought. Good stuff Andrew. However, can I urge you to be a little more precise in your use of terms. The reason that I am being pedantic on this is that there is clearly much confusion in the discussion on UHI between UHI effects (OTOH) and delta UHI (OTOH) over time. UHI effects can clearly be observed by anybody with a temperature readout in their car when traversing a city. In contrast, we are primarily concerned with delta UHI, which we can define as the change in UHI over time as a population centre grows. It is delta UHI that is being confused with AGW, when in fact, it is no such thing. UHI is significant only for local temperature readings. Relative to the global average temperature, UHI has little effect, except in temperature reconstructions of global averages where measuring stations are far more likely to be located in a place with local UHI. Only about a percent or so of the Earth’s surface is even subject to UHI and the influence this has on the average of the other 99% or so is approximately zero. The bottom line is that there’s a finite amount of energy arriving from the Sun and subject only to albedo effects, this finite driving power dictates what the global mean temperature will be. If UHI causes one place to become warmer, another will become cooler. This is just the required consequence of Conservation of Energy. Adjusting surface temperatures to account for UHI is not the right thing to do. The right thing to do is to increase the uncertainty in the measured values as it relates to global averages. The problem with homogenization is that unless the selected data points are exactly representative of the whole, it adds bias and as a result, error terms are no longer a normal distribution around zero, which is a prerequisite for many statistical techniques that would be applied to discern trends. Increasing the uncertainty results in detected trends that are within the uncertainty of the data and thus can’t be discerned as being either real or anomalous. It’s important to recognize that adjusting the data doesn’t decrease uncertainty so trends can pop out, but in fact increases uncertainty. An anti-UHI effect can also be observed with your car thermometer. The central valley of California is a desert with a nominal high summer temp over 100F. With water brought in from the nearby Sierra Nevada Mountains (which of course is a political nightmare in this land of environuts), it becomes very fertile. As you pass from an idle field to a planted field, temperature differences of 2F or more are seen as long as the Sun is shining. Soil, especially dry soil, is generally more reflective than plants, so you would think planted fields would be hotter since less power is reflected away. They are cooler instead because a significant amount of solar power is converted into biomass and not available to heat the Earth’s thermal mass, moreover; transpiration contributes to reducing the energy heating the surface. The is true to the extreme in equatorial rain forests. While it’s an unusual connection, increasing UHI owing to more population requires more crop lands to feed the additional people. Is the cooling from increased agriculture to feed people more or less than the effect of UHI to house those same people? “Our considerations of the future are bounded by our knowledge of the present and our understanding of the past. We cannot change the present, so if we wish to change the future we must look to change our interpretation of the past. And that, I believe, is the central tenet of Climate Science. The problem I have with this work, and Ken’s, is what is the Raw Data BoM provide? The BoM are showing “the public” only “quality controlled data” – which I regard as “adjustment contaminated”. There is no way that anyone can use this “data” to investigate any of the questions a reasonable person might be interested in. Imagine Torok using them in his UHI study. The door to investigations is slammed shut by this BoM practice. It must stop. Every original reading, hourly if they exist, must be available to all. Here’s his analysis of the Sydney Observatory data. 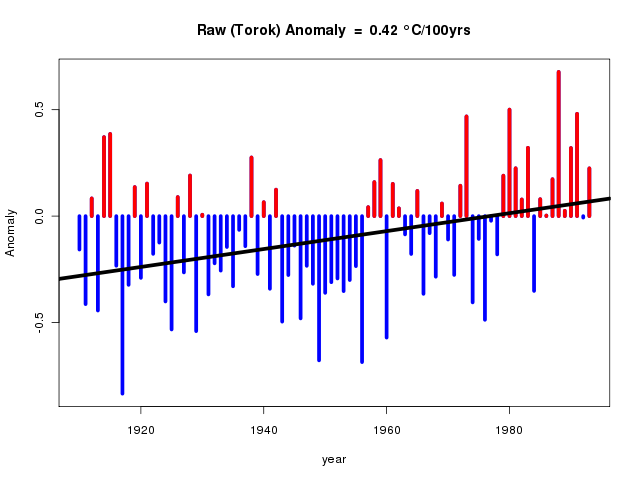 As you can see, unadjusted, i.e Torok reversed the Raw Max data is flat! OT but everybody check out Minnesotans for Global Warming’s latest effort “I’m a Denier” to the tune of the Monkees “I’m a Believer”. Complete with Michael Mann look alike on drums! I wrote some computer software to automate the task. (Still takes about 3 hours to fetch all the data). I cross checked the data against Torok HQ series by reverse applying Torok’s meta-data changes to the HQ series to derive the raw series. They match quite well with only some minor discrepancies which generally do not affect the trend and I put down to transcription errors in Torok’s meta-data. As such I am reasonably confident that the data available from the above link is accurate, in-so-far that BOM measurement taking, record keeping and archival is sound; which I have no reason to think otherwise. Thanks for this; I should of made more of an effort to clarify if I am talking about deltas or absolute values. I hope that readers do not trip up on this point too much: the discussion focuses entirely on changes in temperature over time, including changes in UHI over time as population grows and the process of urbanisation unfolds; not absolute UHI. Stop the Press! Australia’s Global Warming Efforts Have Been Successful! Andrew. The charts you show graphically illustrate what E.M.Smith (Chiefio) and others found in their investigations. The “trick” of adjusting early data downwards to make later data show greater apparent warming. Another thing that literally jumped out at me from the Launceston Airport chart was the starting temperature of about 11.3C used in Torok’s work. 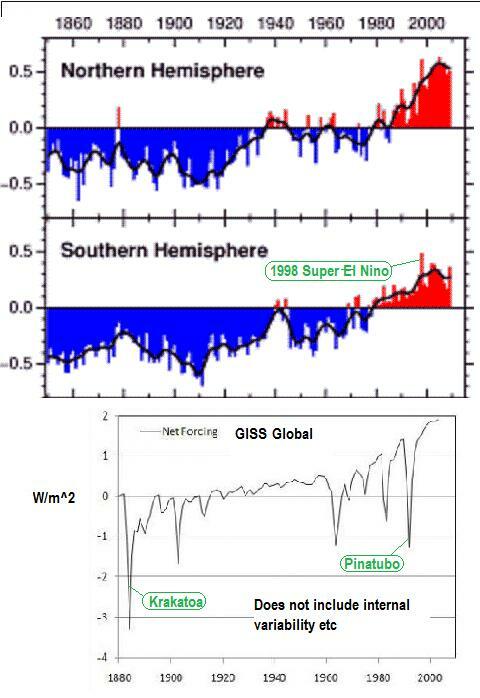 Check the chart shown at NASA’s GISS Surface Temperature Analysis and it shows the first temperature recorded was 12.1C. 61 years later the last mean recorded is 11.8c, 0.3C less than 1939. Apart from making the trend look more alarming, why would that year have been dropped by BoM or Torok? In addition, to my eye at least, since about 1965 the trend shown more clearly on GISS version is down or at least level. 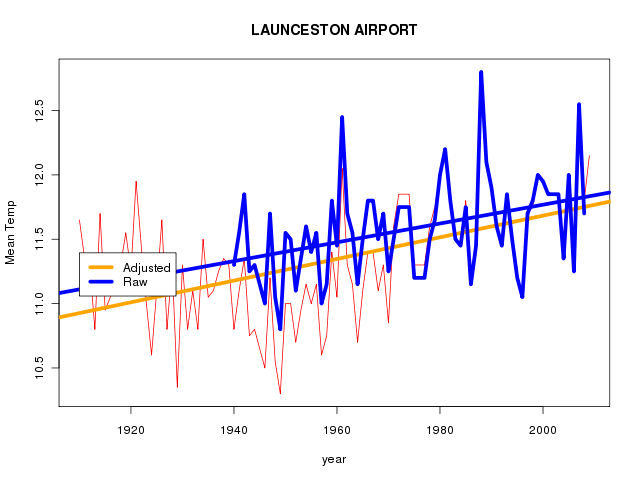 Launceston is also one of many sites round the world that clearly negates the deception put forward by James Hansen at his CDIAC site and so many other warmists at various other sites, that the “cooling in the early 1990′s was due to the Mt.Pinatubo eruption”. This occurred in June 1991 but the charts clearly show temperatures fell dramatically in 1989, 1989, and continued to do so in 1991 before the volcano erupted. Only then would that event have contributed something to the rapidly falling trend. The fall in that period was a tremendous embarrassment to the AGW lobby and Hansen in particular as it followed his appearance before the US Senate Committee in 1988 to spout his dire warnings about alleged “man-made global warming”. The same fall seems to have triggered another very significant action in 1993, that of dropping data from hundreds of surface stations round the world which has been dubbed “The Great dying of Thermometers”. To my knowledge no valid explanation of why this was done has ever been given. However, it does seem to have sparked a whole raft of standardising, gridding, homogenizing and various other means, known and unknown, of adjusting the raw data until it is virtually unrecognisable and of dubious value. Congratulations on your efforts. It is really heartening to know there are many like you round the world prepared to give their time and effort to help expose the truth. Interesting bit on the Maldives where it is claimed that the water level has fallen in the last 30 years due to evaporation. Can we list that as one of the potentially many beneficial effects of AGW? Particularly when that evaporate comes back as snow in colder latitudes or, thanks to our Aussie Gov helping warm things up, as drought breaking, dam filling rains in Victoria. Thank you for the link! That video is absolutely hilarious! But I just noticed that the Australian Governement has an add on the Minnesotans for Global warming website. I would suggest we get clicking, let’s help them out! Andrew – yes that’s the site where I, and Ken, got the raw data from. When you say Torok HQ data series what series do you mean? Another great post on the fraudulent manipulation of data to support AGW. The 3rd graph also shows the lie of the AGW stock answer that aerosols were responsible for the cooling in the mid-part of the 20thC. Data from Torok study is available here. It contains HQ series but it also includes information on what adjustments were made, dates, magnitude of the adjustment + some information on reasons for the adjustment. From this I was able to reverse engineer the ‘raw’ data used to generate the HQ data by subtracting adjustments away from the HQ. I then selected a few stations at random, compared raw series generated this way from the data available from the link above. I found that visually, they corresponded almost exactly and the differences are generally minor and non-cumulative. Andrew – yes that’s the site – just checking as I found that site as I wasn’t sure if you were aware of it. 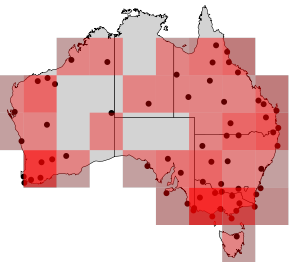 There’s also the BoM HQ data site which is another series all together. There are just way too many if’s, but’s, likely’s, not clear, undisclosed, appears to be, approximate possible, speculative points etc, etc, for this article to be taken seriously. The author does at least aknowledge the BOM. Richard Wakefield has done some work on Canadian surface temperatures. He has found that trying to merge records, or use them to estimate nearby surface temperatures does not work in any manner that is satisfactory. Run the two presentations — they might surprise you as they show no significant warming in the Canadian Climate — despite the dire warnings from Environment Canada! That my article fails to provide the level of certainty you seem to think exists elsewhere is of little concern to the key issues my article raises. I too wish for more certainty in understanding the world around me, but in the absence of that I will, like others who labour to actually understand the world around them, make the most with what I can get. Most of your objections should be levelled at the BOM, not myself. Joanne tried to contact the BOM in order to qualify a number of items but no response was forthcoming. I could of chosen to write the article with a more authoritative tone in a number of areas, but I prefer honesty and forthright and I respect the intelligence of the reader by not trying to hide or diminish any issue or discovery. A number of areas (such as CAM method), I am actually quite confident that I am right, but I qualify just in case I am indeed wrong. Never assume anything and keep your mind open to the possibility that you may be incorrect. David Jones once said that the the homogenization process is not biased towards warming: spoken with certainty and confidence. Here is a statement I can say with the same level of confidence and certainty : David Jones is dead wrong. 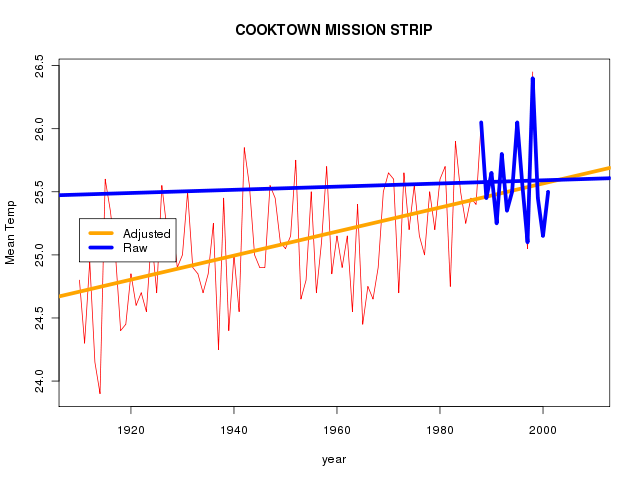 Yes the raw trend is 0.7 consistent with most land surface reporting, and maybe it is indeed caused by entirely by AGW and that it is at a sufficient level to trigger CAGW. I am prepared to consider this possibility and I regularly do. Are you prepared to consider the possibility that you are wrong? But this is just a sideshow; the key point of the article is shine light on the fact that the BOM are not bringing their A-Game to this issue, inspite of it being the “greatest moral challenge of our time”, and that we as a nation turn to them as domain experts in order to help us with sensible/rational policy formation. Yet the quality of their analysis is demonstratively poor. If a subordinate in my professional discipline came to me with equally poor analysis they ostensibly insisted was accurate and well thought out, then they can count on receiving a fierce dressing down. If one were insist on placing complete trust in people who speak in terms of certainty when no such thing exists, who demonstrate powerful bias in their work ethic and who demonstrate limited analysis prowess; then I can only conclude, with a reasonable level of certainty, that such a person is a foolish person. What will happen next to the real (blue) temperatures seems obvious. Also all that cooling biomass will need and eat a lot of CO2. Unless this biomass dies off again quickly it will be like any growing body needing more food. It will have an insatiable appetite for CO2. These ifs and buts precisely reflect the weasel words used in the material released to the main stream media in support of the hypothesis of Anthropogenic Climate [insert word of the day]. I, for one, would not be a sceptic if I were presented with empirical facts, verifiable data, and the algorithms used by the models to demonstrate the causal link between a rise in CO2 and a subsequent rise in temperature, and which quantified how much of that rise was due to anthropogenic sources. Other fields of science need to produce this material for public review, why is climate change any different? Annual mean maximum temperature for 1859 = 21.4 °C is stated just above. I recognise all of these figures. 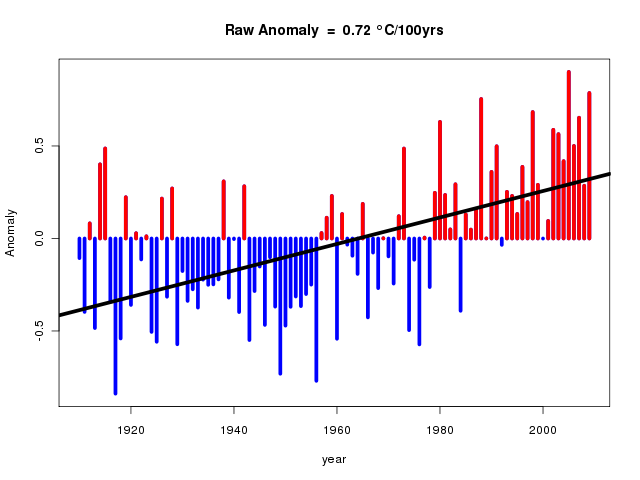 They are not the raw data but have been adjusted downwards by 1.2 degrees Celsius. Is your excellent analysis (much too clever for me) built on sand? The real raw data is hidden in the other BoM site you also listed at #17. I wish and hope that raw data is listed on the “public” BoM web site somewhere but you are giving me no feeling that it is. Data subject to change without notice or reason. Yes, you do! I hope that you have a moment of clarity and get the help of a competent mental health professional before it is too late! What strikes me interesting in all this analysis is the amount of implied guesswork and at the least accepted speculation. My gaawwd, I work in an unskilled area, and if we guess when we install insulation we burn houses down and at the least waste our time, and innevitably money. If me/us can be accurate with our limited education, I damn well expect people who I’ve paid taxes to educate get it right and stop treating this issue like a hobby that only requires recreational attention. I have a feeling a lot of these people don’t appreciate that others in the economy live and die, so to speak, bur some literally, by the accuracy of their activity and calculations. “Is the planet warming to the point of causing us problems”? And the standard answer seems to be “well if we would all stop our wicked ways we’de be alright”. Hey!, Noddy, I didn’t ask about your half baked ideology! “Is the world warming or not”? “You’ve had 30 years and billions, your kidding! go rip someone else off, your fired’! There is a revolution coming that is likely to burst the green global warming bubble: the temperature trend used by the IPCC (the U.N.’s Intergovernmental Panel on Climate Change) to support their conclusion about anthropogenic global warming (AGW) is likely to turn out to be fake. The situation will become clear once Virginia’s attorney general, Kenneth Cuccinelli, obtains information now buried in e-mails at the University of Virginia. Or Hearings on Climategate by the U.S. Congress may uncover the “smoking gun” that demonstrates that the warming trend used by the IPCC does not really exist. is posted 27/9/2000 and Warwick says ‘This page presents three Australian State Capital temperature records compared to nearby rural or more rural neighbours. 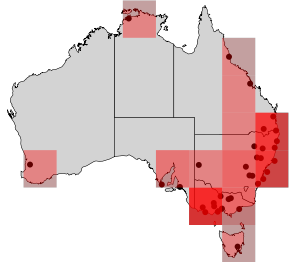 This is a significant area for study because south eastern Australia has probably the best set of long term rural temperature records in the southern hemisphere. 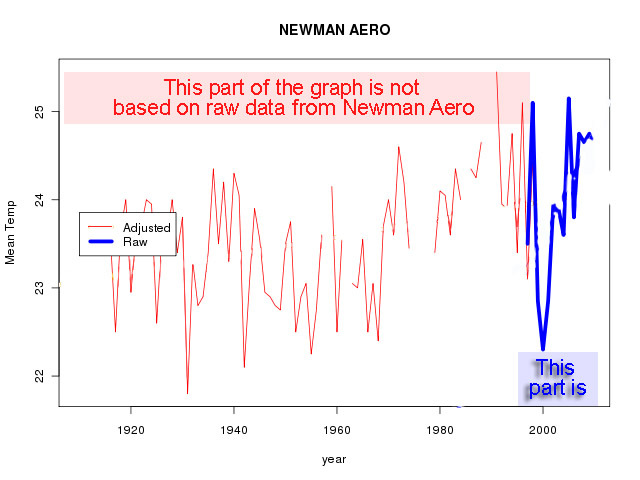 The differerence is stark with BoM finding much warming over SE Australia since late 19 C while NASA finds little trend. At http://www.warwickhughes.com/climate/ 26, June, 2005, Warwick has a site which in his words exposes the errors and distortions in temperature records used by the IPCC as evidence of “global warming”, Warwick says the central contention of these pages is that for over a decade the IPCC has published global temperature trends distorted by purely local warmth from Urban Heat Islands (UHI’s). 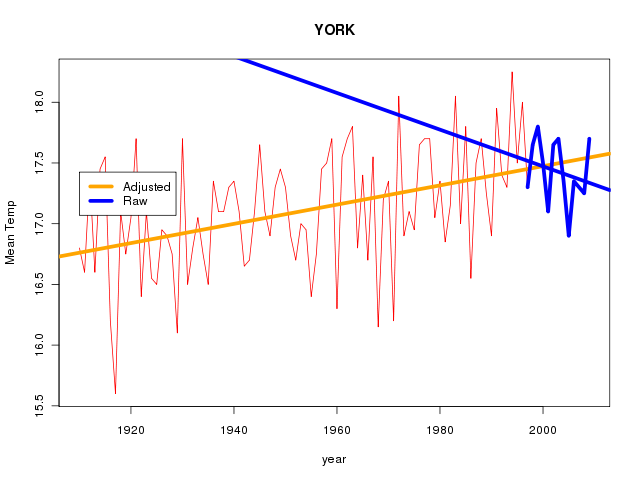 There is simply no systematic compensation for urban warming in the Jones dataset. 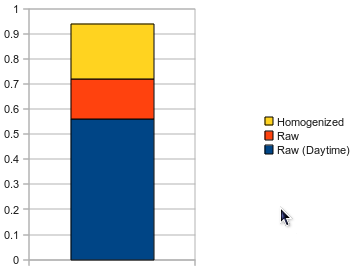 Occasionally there is a slight adjustment in a record for a site change or other anomaly but the majority of records are used “raw”. I’m neither a scientist nor a statistician, but I have a question which nobody seems to have addressed: How can data be input and graphed for the years before a location actually, physically existed? 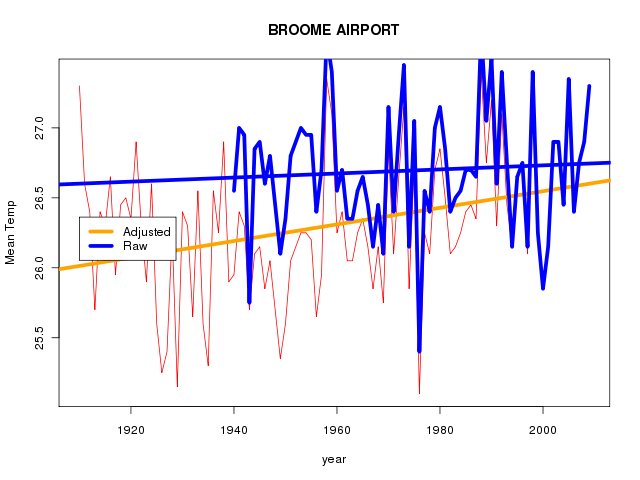 In particular, refer to graphs for Alice Springs Airport, Broome Airport and Newman Aero which show red lines (which I assume is graphed data) for the years prior to 1940. 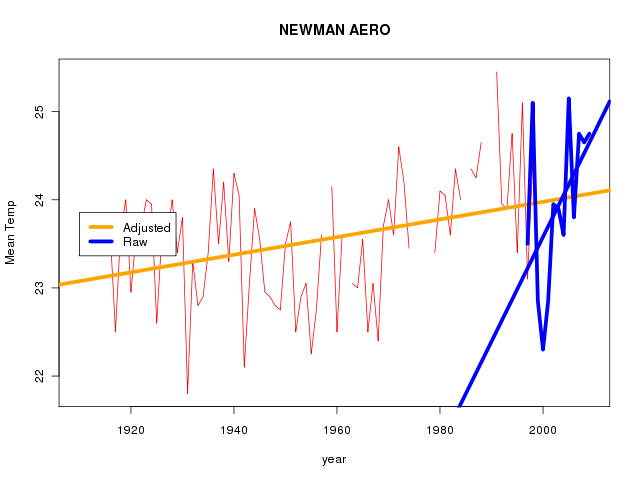 Newman Aero did not exist until the mid-late 1960′s (neither did the town of Newman), and both Broome and Alice Springs Airports would have been very basic dirt airstrips in the 1930′s,possibly not even in the same locations as today. Can somebody please set me right? Well done Andrew- Ifeel vindicated! You have confirmed by rigorous statistical methods what is blindingly obvious to anyone who checks the two data sets- raw vs HQ. Newman HQ is constructed by splicing the airport and post office records- but they don’t overlap and the PO starts in 1966- so BOM’s High Quality long record station has data from only 44 years ago. The rest of their data I believe is “created” (and I use the word advisedly) by using data from Mundiwindi, 71 km away. The HQ record is aBOMinable. janama @ 5: I fully agree with you and am currently checking a small subset of data not yet quality controlled. Bingi @ 20: have you checked my work yet? It’s easy to do using the links listed above. (Andrew’s work will be completely beyond you.) When you have, get back to us with what you have found. I can’t wait to hear a real reasoned argument from you. In his discussion of the UHI effect, Andrew Barnham refers to a document ‘Projected changes in temperature and heating degree-days for Melbourne 2003-2007′ prepared by the CSIRO in 2001. It’s interesting that even back then, as far as the CSIRO was concerned, there were only two significant influences on the Melbourne mean temperature to consider, namely increasing greenhouse (CO2) and increasing urbanisation — if it wasn’t the one, then it had to be the other. The brief concluding qualification dismisses natural variability (which presumably accounted for 100% of climate change prior to c. 1950): “……This study addresses underlying trends in temperature due to greenhouse warming and urbanisation….It does not include the influence of natural climatic variability on the year-by-year evolution of temperatures, which represent deviations from underlying trends…”. That conclusion was based only on one decade (the previous decade) of post-war significant global warming. 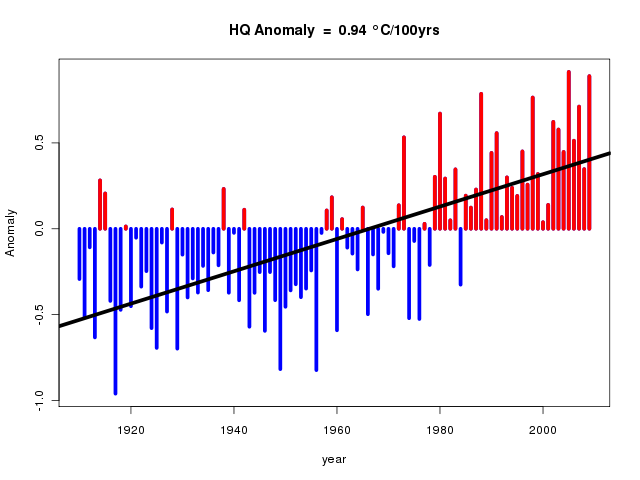 The raw data (blue line) is well above the HQ in the first half of the 1900s. For a different angle on uhi vs rural locations, I compare the current 12 month average min and max at 32 locations in WA with a baseline from raw data around 1900 – i.e. average min 12.96 and max 25.12 at the 32 locations in the year 1900. One year is not an average but make what you will of those trends. What was interesting is that all of the increase in max (daytime) temperatures since 1911 occurred in the last 30 year standard while the increase in min (nighttime) temperatures has been gradual over the last 5 periods. This might suggest different causes eg fewer clouds and more sunlight reaching the Earth’s surface over the last 30 years. Great work, I was partcularly intrigued by the lower change in temps in urban areas compared to rural over 100 years. I was wondering whether this may be due the greater thermal mass of towns and cities? Any change in energy of the atmosphere would be buffered in cities when compared to rural areas. The exception would be rural areas with heavy forest or large water bodies. I feel that this statement in the conclusion section of Andrew Barnham’s article is relevant to Global Warming and its human drivers. Why is Andrew’s “uncertainty” not within the scope of his article? The problem with statistics is that it doesn’t necessarily require a scientific foundation in order to arrive at conclusions. In other words statistical analysis is extremely dependent on the assumptions made and the chosen methodology. Statistics is not a science. We have Global temperature and CO2 data sets from various sources (including ice cores etc) dating back many thousands of years. We currenlty have satellite temperature data scanning of the entire planet. Who is brave enough to dispute that the accurate satellite data does NOT show a significant jump in average global temperature – and more importantly that this warming trend cannot be explained by any natural or cyclical variation? PeterR asks: Why is Andrew’s “uncertainty” not within the scope of his article? Because I need to make a living and I have lots of things pressing for my time. If/when I get some spare time I plan to dive in deeper. But not anytime soon. Sorry – but I am going to call this out for what it is: it is a nonsense statement. You are presented with data you need to make sense of it and what the implications of that data is and what it tells us about the world around us. Statistics is the tool. Yes someone who lacks competency will misapply tools accidentally and someone driven by an ideology will misapply tools deliberately. Just because the numbers do not bear out your preconceptions is no justification to rubbish on the methodology or you to apply methodologies required in order to ‘torture the data’ in order to vindicate your preconceptions. If the data said we are warming the planet and the warming is dangerous, I wouldn’t be a sceptic. But the data simply does not say this with any level of certainty or confidence. 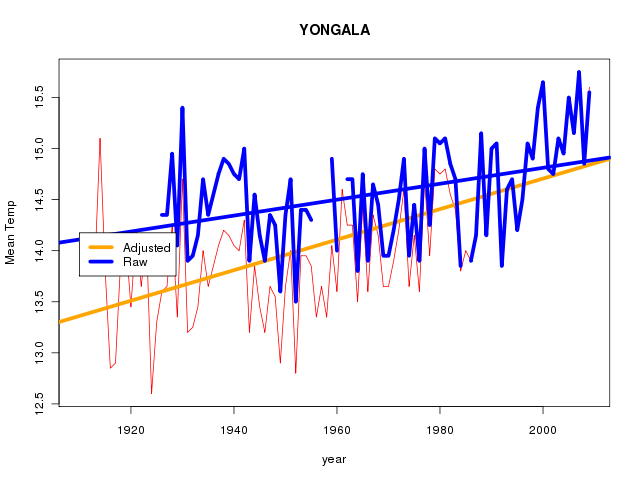 The data, especially the paleoclimatic data; provides a strong case against CAGW hypothesis. As for the satellites, they have their own problems: and are not perfect measuring devices. Being in orbit, I would imagine it would be difficult to accurately/perfectly measure land surface temperature of the planet below you. It’s strange how in this day and age there is less scruples than days gone past. Even the Royal Society, the bastion of sound, scientific practice, is arrogant in its refusal to publish methodologies (their own basic tenet) even under FOI. Your work, among others (eg Ken Stewart’s), shows the shambles that is Western science; a shadow of its transparent, previously verifiable, self (or am I deluding myself). Correct me if I’m wrong, but I don’t think you’ve published your version of a revised, OZ, temp series, base data (not just as a graph). Would you be happy to post it?